Buckeye Bulldog Rescue is dedicated to rescuing homeless and abandoned English and French Bulldogs from high-kill shelters and owners who can no longer care for them. By working with committed volunteers, foster homes, veterinarians, and trainers, we rehabilitate and re-home bulldogs in Ohio and its surrounding states by finding them well-matched, carefully screened forever homes. We also serve as a resource to our community by providing education and information on responsible pet ownership and what it takes to own these charming, but high maintenance pups. Ohio Fuzzy Pawz Shih Tzu Rescue rescues shih tzus from a variety of sources and takes many last resort cases where a dog would otherwise be euthanized, if not taken into the rescue. Founded in 2005, Ohio Fuzzy Paws is an all-volunteer and foster-based organization averaging 160 placements per year! Nika came to BBR as an owner surrender. Purchased from what was assumed to be a reputable breeder, Nika inexplicably began to suffer from a failure to thrive. After spending thousands of dollars on medical care with no clear diagnosis and little to no improvement, her owners made the difficult decision to surrender Nika to BBR. Nika is currently in the care of one of our most experienced and capable fosters who hand feeds her, keeps her on her regimen of medications, takes her to her multitude of vet appointments and gives her lots of love. During her time with us, we have learned that she had suffered a dislocated jaw and broken arm before coming to us. She was diagnosed with meningomyelitis and regurgitates several times a day. She spent time at MedVet a few weeks after coming to us due to some difficulty breathing and suspected pneumonia. Thankfully, she is doing OK but due to her fragile state and near death experience under anesthesia for a CT scan, we are taking things one step at a time. 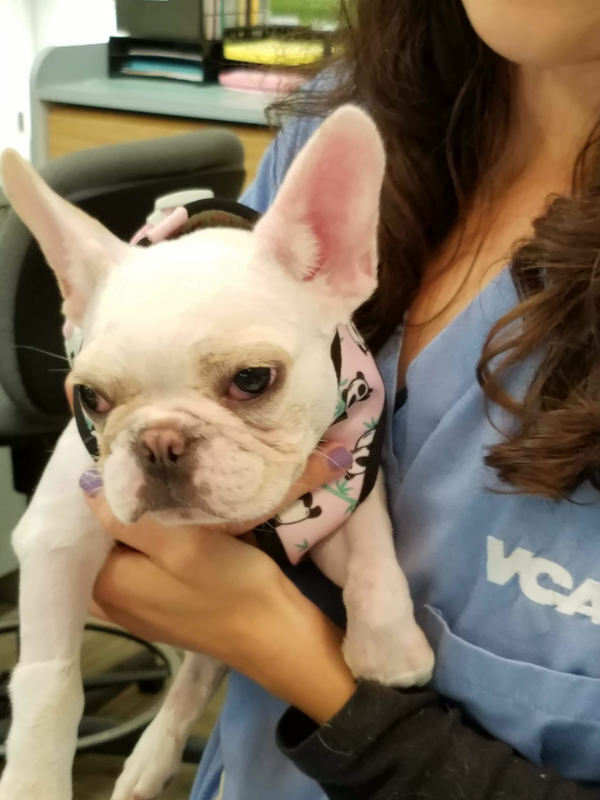 While her prognosis is still uncertain, Nika is a very happy dog, who is tiny but mighty and enjoys taking walks with her foster mom and playing with her Frenchie foster brothers. ​Veterinary costs for Nika: $2600 and counting. Through the tireless efforts of our committed group of volunteers, Buckeye Bulldog Rescue has made a difference for more than 500 dogs since 2013. With your help, we can achieve our dream of a dedicated facility. This facility will meet the needs of our more difficult to adopt cases. They will live comfortably and work with trainers and veterinarians who could help them achieve their full potential. With your help, they will go on to the loving homes that every pet deserves. ​Please help us achieve our dreams by becoming a sponsor and/or contributing to our exciting dream raffle and silent auction. All donations are tax-deductible and all proceeds will go directly toward the medical care and re-homing of Bulldogs in need.